Murray Gell-Mann (born September 15, 1929) is an American physicist who received the 1969 Nobel Prize in Physics for his work on the theory of elementary particles. He is the Robert Andrews Millikan Professor of Theoretical Physics Emeritus at the California Institute of Technology, a Distinguished Fellow and co-founder of the Santa Fe Institute, Professor in the Physics and Astronomy Department of the University of New Mexico, and the Presidential Professor of Physics and Medicine at the University of Southern California. Gell-Mann has also worked at CERN, as a John Simon Guggenheim Memorial Foundation Fellow in 1972. He is known for his study of particle physics, the smallest parts that make up the universe. These small particles behaved in ways that did not appear to follow the known laws of physics, and Gell-Mann came up with the idea of giving them a strangeness number which could allow them to be compared and put into categories. He also came up with idea that parts of an atom, the proton ad the neutron were made up of even smaller particles. He called the quarks, a nonsense work from James Joyce's book, Finnigan's Wake. Gell-Mann then developed the idea that quarks were held together inside the nucleus by a force he called "color", and this force could be given a quantum number. With Richard Feynman he discovered a weak interaction between sub-atomic particles. He has been researching string theory which could could explain what makes up the smallest particles and forces. 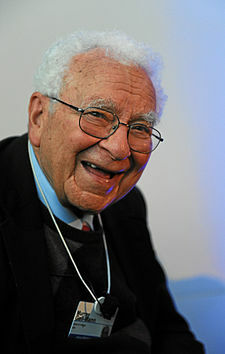 ↑ "Professor Murray Gell-Mann ForMemRS". London: Royal Society. Archived from the original on 2015-11-17. ↑ "Murray Gell-Mann - Biographical". NobelPrize.org. Nobel Media. Retrieved 17 September 2016. ↑ "CERN-affiliated article by Gell-Mann". Springer. Retrieved 11 June 2015. This page was last changed on 31 August 2017, at 08:23.